The Texas Senate Finance Committee approved a bill Saturday that would put one-time influxes of money toward the Teacher Retirement System and teacher bonuses, and require districts to fund $1,000 in teacher pay raises. The Senate Finance Committee Saturday approved a proposal Lt. Gov. Dan Patrick listed as a priority for Texas education: providing bonuses and pay raises for long-term teachers, and reduced health-care costs for retired teachers. 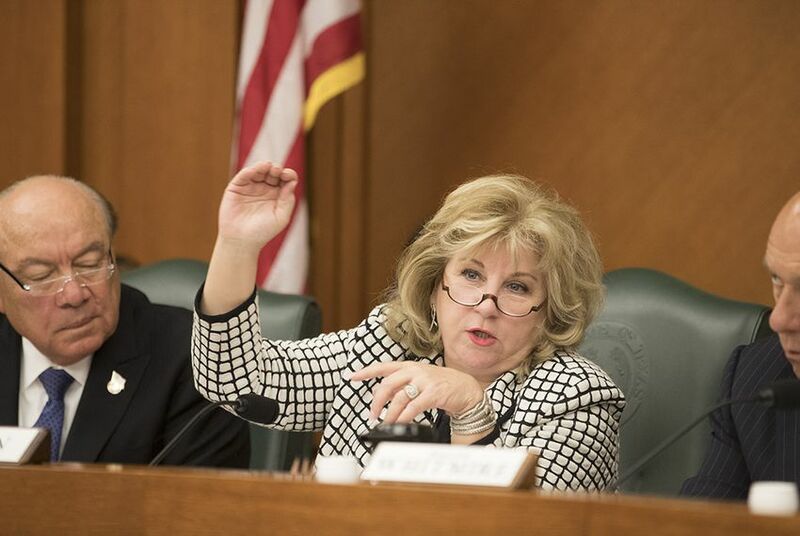 The committee voted 10-3 to approve Senate Bill 19, authored by Sen. Jane Nelson, R-Flower Mound, which would provide $193 million for teacher bonuses starting September 2018, put $212 million into state-run health insurance for retired teachers, and require school districts to increase teacher pay by $1,000 starting in 2019. The senators who voted for the measure were Republicans; those who opposed it were Democrats. State Sen. Juan Hinojosa, D-McAllen, was present but decided not to vote. The full Senate could consider the bill as soon as Monday. Educators and activists who testified opposed the part of the bill requiring districts to raise teacher pay, since it would not necessarily come with additional money from the state. SB 19 addresses one of the 20 priorities Gov. Greg Abbott put on his agenda for the July-August special session. Patrick laid out the specifics of the plan in a press conference earlier this month. Nelson proposed borrowing money for the bonuses and health benefits from the Health and Human Services Commission, by deferring payments to health care companies that provide Medicaid through the state's privatized system. "I will work to ensure that the deferral will not affect any services" for Medicaid, Nelson said. She called SB 19 a "bridge" while legislators work to solve larger issues with the school finance system. Legislators argued about whether, and how, to turn the short-term changes in the bill into long-term solutions to help teachers. With limited flexibility in the budget, which has already been approved by the governor, they are looking for creative ways to fund provisions they hope to pass during the special session. Even with the additional money through SB 19, the state-run Teacher Retirement System will see a projected shortfall of $500 million to $700 million in 2020-2021, which will increase to $2 billion by 2022-2023, according to Brian Guthrie, TRS executive director. School employees have absorbed most of the healthcare premium increases over the years, with state and district inputs remaining close to fixed. "We say we're going to make a commitment, but we are also saying we're not going to increase the state statutory contribution rate," said Sen. Kirk Watson, D-Austin. Tim Lee, executive director of the Texas Retired Teachers Association, begged the panel not to let political debate get in the way of accomplishing TRS reform during the special session. "I am almost begging you. Please do not let the session end with nothing happening," he said. "We are going to stay focused," Nelson responded, despite likely disagreement with the House on how to pay for school finance issues. She called the House's willingness to use the Rainy Day Fund, a pot of emergency cash for the state, a "false promise" and short-term solution. Educators opposed the part of the bill that would require school districts to fund teacher pay raises, without the promise of state funding to help bolster the cost. "We don't want to have to reprioritize money from within our districts to find money" for pay raises, said Tonja Gray, a member of the Association of Texas Professional Educators and a reading intervention teacher at Abilene ISD. "I would rather have nothing than this bill." "It's this or nothing," Nelson said. She argued there are ways to fund the pay raises, which would start in 2019. Legislators would have to decide how to fund the pay raises during the next legislative session. Disclosure: The Texas Retired Teachers Association and the Association of Texas Professional Educators have been financial supporters of The Texas Tribune. A complete list of Tribune donors and sponsors can be viewed here.